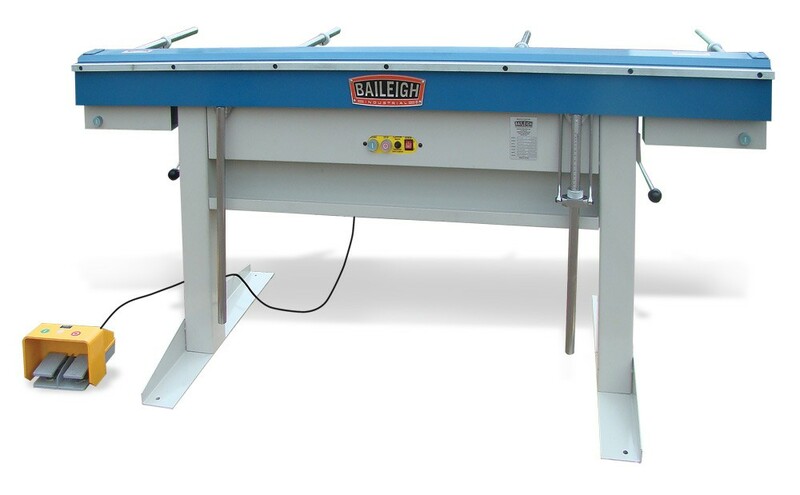 Following in the footsteps of Baileigh Industrial’s popular BB-4816M, is the BB-7216M magnetic sheet metal brake. The BB-7216M box and pan brake carries over all the great features of the BB-4816M, but in a length that is a little more user friendly. The BB-7216M has over 78 inches of bendable area, which will allow the operator to get even more creative with the uses for this sheet metal brake. Operating on 220 volts, the BB-7216M uses a heady duty magnet to clamp the material between itself and the bending “clamp bar” or finger. Because the BB-7216M sheet metal brake uses a magnet to hold the material and “clamp bar” the operator is not required to use the supplied bars. This opens up a world of possibilities and applications that are just not possible with traditional box and pan brakes. Totally enclosed boxes, triangles, alternate bends on varying planes, round items such as scrolling applications, and much more are now possible. Once you start using the BB-7216M magnetic box and pan brake there will be no turning back. It’s one of the easiest box and pan brakes to operate on the market. To initiate a bend on the BB-7216M magnetic brake simply put a piece of material between the clamping bar to the depth required, hit the foot pedal control that softly clamps the material, allowing for any repositioning, once ready, lifting the leaf arms engages full magnetic power (6 tons) holding the material in place as the leaf arm makes the appropriate bend. One of the biggest advantages of this type of box and pan brake is that the magnetic power of 6 tons is consistent across the entire beam allowing for very crisp bends even in the middle of the machine.